Classic Arctic Cod Liver Oil has always been derived from 100% wild Arctic cod, no other fish oils or synthetic additives are ever used, supporting the heart, brain, and nervous system, while promoting optimal immune system function. Nordic Naturals has always used 100% Arctic cod livers in their cod liver oil (CLO) formulasno fish body oils or synthetic additives are ever used. Nordic Naturals Arctic Cod Liver Oil from Norway is molecularly distilled and enhanced with antioxidants for freshness and great taste. 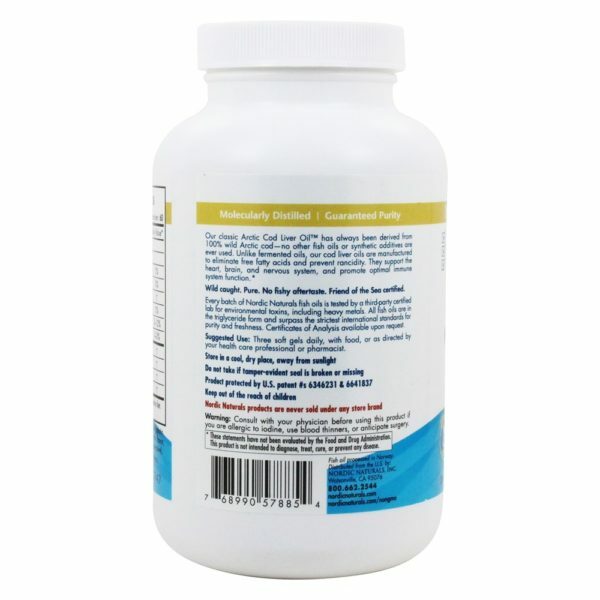 These soft gels contain only naturally occurring vitamins A and D.Nordic Naturals has always used 100% Arctic cod livers in their cod liver oil (CLO) formulasno fish body oils or synthetic additives are ever used. Arctic cod (Skrei) has the highest DHA, vitamin A, and vitamin D content of any cod species. 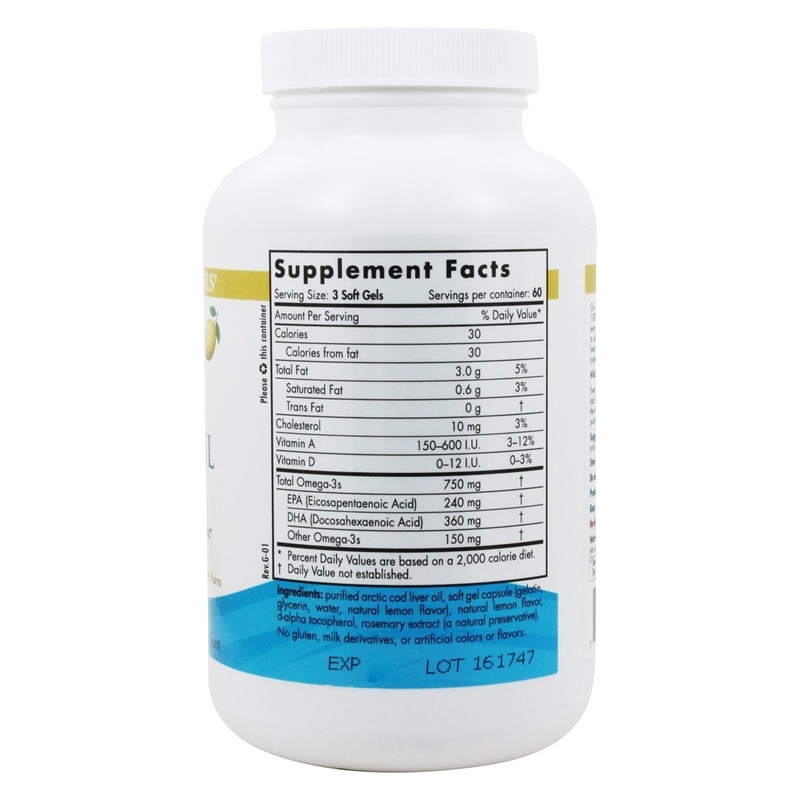 On average, Nordic Naturals CLO delivers over 125 mg more DHA per serving than other CLO products. Each serving provides approximately 621 mg of the essential omega-3 fatty acids, EPA and DHA, fulfilling the expert recommendation of a minimum of 500 mg per day. Our classic Arctic Cod Liver Oil has always been derived from 100% wild Arctic cod- no other fish oils or synthetic additives are ever used. Unlike fermented oils, our cod liver oils are manufactured to eliminate free fatty acids and prevent rancidity. 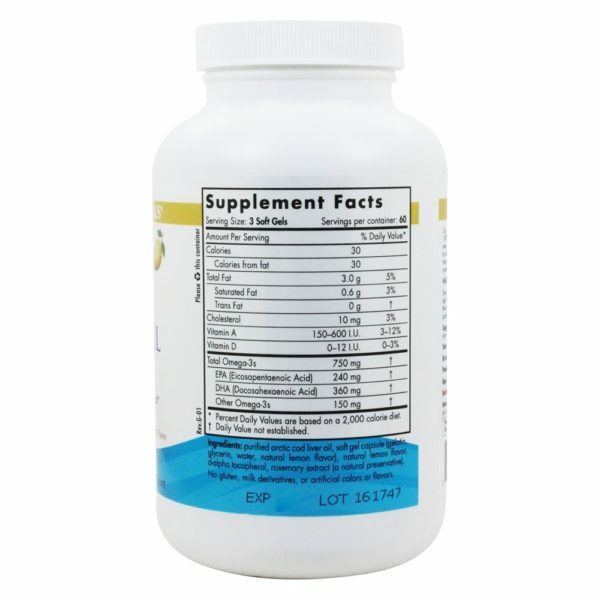 They support the heart, brain, and nervous system, and promote optimal immune system function. 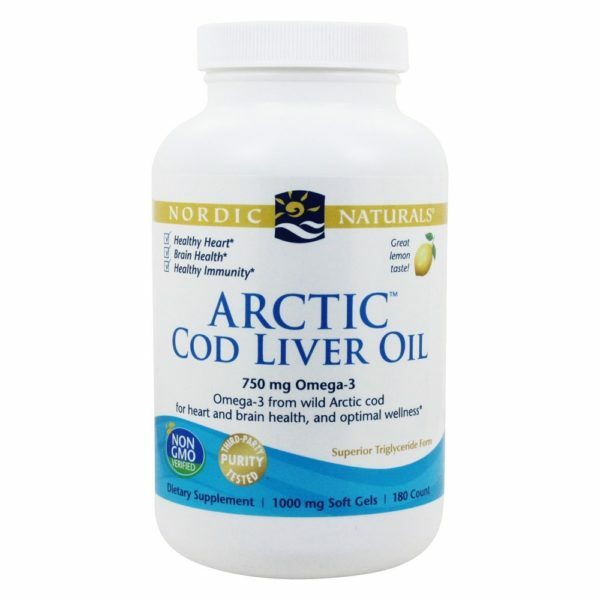 Nordic Naturals - Arctic Cod Liver Oil Lemon . - 180 SoftgelsSupplement FactsServing Size:3 Soft GelsServings Per Container: 60Amount Per Serving %DVCalories27 Calories from fat27Total Fat Saturated Fat Trans Fat****CholesterolVitamin A900-18-Vitamin D1-0.25-Vitamin E (d-alpha tocopherol)45IUOmega-3sWeight Volume % EPA (Eicosapentaenoic Acid) DHA (Docosahexaenoic Acid)375mg Other Omega-3s Total Omega-3s756mgOleic Acid (Omega-9)360mg* Percent Daily Values are based on a 2,000 calorie diet. **** Daily Value not established. Natural TriglyceridesLess than of Cholesterol per serving.Other Ingredients: purified arctic cod liver oil, soft gel capsule (gelatin, water, glycerin, natural lemon oil), natural lemon oil, d-alpha tocopherol, rosemary extractMay have been manufactured on the same processing line as products containing soy derivatives.No gluten, milk derivatives, or artificial colors or flavors. 3 sofgels daily, with food, or as directed by your health care professional or pharmacist. Consult with your physician before using this product if you are allergic to iodine, use blood thinners, or anticipate surgery.Keep out of the reach of children. Nordic Naturals - Arctic Cod Liver Oil Lemon 1000 mg.
**** Daily Value not established.